That phrase is a constant frustration to church leaders. I understand the main point – change is painful, so only make changes when it is necessary. I get that. Honestly. I do. However, it basically puts leaders in an impossible position. It means that, in order to advocate for change, we have to do a smear campaign on the current situation. I say that because I want to give some thoughts on training and theological education but they could be misheard. This is such a big issue that it will cover a few blog posts – but please remember the following two points: 1. I do think a lot of good things are going on. I’m not saying that everything is bad. 2. However, I do think that the situation is so serious that change is needed desperately. Let’s be honest. The church in the UK is in a mess. Not long after returning to the UK I had coffee with one of my theology lecturers, Graham McFarlane. At one point in the conversation we chatted about the sad state of the church today. He blamed me – Pastors send such poor students that the theological colleges can’t do anything with them. I blamed him – the colleges do such a bad job in training the Pastors that no wonder the churches are in a state. Touché. The church is in a mess and churches and training institutions must all share the responsibility. 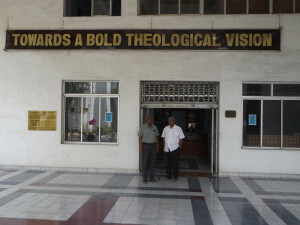 In Chennai, I was taken to the Gurukul Lutheran Theological College. After a tour of the college (including sitting in on second year Greek) I was due to meet the Principal. Unfortunately, due to missing my plane from Mumbai that morning, I was too late to see this. I say unfortunately, but I think things worked out better. Instead Daniel, the Registrar, was happy to tell me all about the college. After giving me all the facts and figures I asked him a few questions. The last one was about spiritual formation – how did the college do that? At which point he looked me in the eye and asked, “Do you want the honest answer or the official one?” I assured him I’d much rather have the truth. So he gave it to me, with both barrels. Being a Lutheran Pastor is now a profession. The students are just interested in passing exams and getting good jobs. The ethos is all about status and personal advancement; about preserving the power and prestige of the college. His assessment concurred with what my Indian friends had told me previously. I thanked him and encouraged him to start a revolution!? Another thing I did while in India is watch the film ‘Spotlight‘. I had been wanting to do it for ages. The film portrays the uncovering of systemic child abuse in the Roman Catholic Church in Boston, USA. It makes for chilling viewing. Not just the awful child abuse but the way the RC community closed ranks to collude in covering it up. Only an ostrich can ignore the fact the church is at a very low ebb in the west. And Protestants are deluded if we think we are doing much better. Many people view the church as morally bankrupt; and with good reason. Jesus called us to be ‘salt and light’ in Matthew 5. Does our local community experience us as either? A joke I frequently make about myself is that the churches that have appointed me as Pastor only did so when they became desperate. I’m only half joking. Cambray Baptist took a big risk when they first spoke to a 29 year old who was an Assistant Pastor in Edinburgh. In the previous 150+ years of the church’s history they only called Pastors who had previous experiencing of leading smaller churches themselves. I’m often asked by churches for potential names I can recommend – it is not a long list. Now, it is a good thing not to be bound by tradition and to make bold appointments. But let’s face the facts – we are not producing a large cohort of great church leaders. There may be many applicants for vacant positions but when was the last time that there were many high calibre applicants? Things have improved a little over the last decade or so but it still looks grim. Again, there are some wonderful exceptions, but I include myself when I say the church in the UK is at a low ebb. I am not despondent. The UK was in a much worse state in the 1740s and yet God raised up men like Wesley and Whitfield to turn things around. Nevertheless, it is broke. It does need fixing. I don’t think the situation in India is the same as the UK but there are some frightening similarities. Therefore the next two posts are going to cover two big problems that need addressing. The second issue is by far the most important but I hope it will become clear why I do them in reverse order. The photo below is of Gurukul Lutheran College. The banner carries the answer, but it needs to be carried out.